Lynn was born in Baltimore, Maryland to Harold & Evelyn Hill. A graduate of the University of Maryland with civil and mechanical engineering degrees; he had a long career in his field. He worked for Hardy Corporation, designing dams and bridges and had partnership in a business doing test and balance. He spent his latter years in heating and air conditioning design. Lynn enjoyed playing Lacrosse at both Catonsville High School and at the University of Maryland. He raced sports cars and enjoyed rally races. He and his spouse loved traveling in a camper throughout the US and Canada. They also enjoyed going on trips and attending events with the “Joyful Hearts” seniors through his church. He loved the Lord Jesus Christ, his church and church family. 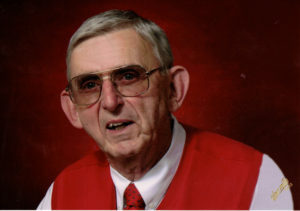 He loved teaching and taught Sunday School for many years and held services at Chandler Nursing Home for about 35 years. Survivors include his loving wife, Cheryl Hill, brothers Dennis (Peg) Hill, Bruce (Cathy) Hill, sister, Nelda Ring. Children: Todd (Jennilee) Hill, Chris Hill, Cheryl (Danny) Rast, Carolyn Huebel, Todd (Jane) Wilson, Michael (Jennifer) Wilson, Ross Wilson. Grandchildren: Caleb, Ella, Gabe and Libby Hill, Christian, Anna Marie and Julia Hill, Faith Braun, Kenneth Miller, Amy (Daniel) Coppock, Blake Rast, Santanna Ward, Chase and Chandler Johnson, DJ (Karoline) Traynor, Ryan (Jessica) Wilson, Kyle (Mallory) Wilson, Ella Faye Wilson. Great-grandchildren: Malia and Milei Braun, Liam Ward, Briar Wilson, Cross and Crimson Coppock. Visitation to be held Thursday, January 24, 2019 from 12:00 – 2:00 p.m., with a funeral service immediately following, both held at First Baptist Church (FBC), Alabaster.